The start of the history of the jews of North-Africa coincides with the creation of Carthage by the Phoenicians, 28 centuries ago, and the de veloment of trading posts from Tunisia to Morocco. Witness accounts exist about the trading practices of the jews with the Romans as soon as the 4th century BC. These first jewish communities will be joined by the jews of the first diaspora at the destruction of the Temple of Jerusalem, in 581 BC. Towns like Sala (near the actual Rabat) and Ifrane become important trading centers for the Moroccan jews in the business of gold and salt. In the beginning of the christian era, the Roamns invade the region, without much resistance from the berber and jewish tribes, and rename Morocco "Mauritania". Archeological digs show a strong jewish presence in these new roman provinces. Starting from the 2nd century, christianity begins to penetrate in Morocco and it will go as far as find a sympathetic ear in some jewish tribes. In the beginning of the 5th century, the Vandals begin to invade Morocco, and in 430 , chase away the Romans from North-Africa. Under the Vandal occupation,the jewish enjoy a great freedom of faith for a century. In 533 , came the turn of the Byzantine chistians to invade the Maghreb. The jews will then live through a very dark era, with forced conversions,harassment, and persecutions, but even that will not stop the coming of the jews from Spain who were persecuted there by the Wisigoths. The arabic conquest begins at the start of the 7th century, against the opposition of the jewish tribes, but that will not stop the creation of the Great Arabic Maghreb. In 711 , the rabs cross the Strait of Gibraltar and begin the conquest of the Iberic Peninsula, with an army made of, in part , jewish soldiers. During almost 4 centuries,the jews participate in the boost of the arabic civilization in North-Africa. Some of them are assigned to high-ranking positions , with some highs and lows, as in the 11th century, under the Almoravid dynasty. This same period will also witness the influence ,as far as Morocco, of spanish judaism. In the middle of the 12th century, a new dynasty, the Almohads , settle by force in Morocco. Under their reign, the jews in Morocco and even Spain, will suffer the worst of persecutions. In 1165 , the Dayan of Fes is burned alive. The jews will be forced to wear distinct clothing, blue and large, and the head covered by a yellow shawl. From the 13th to the 14th century, under the Merinid dynasty, the jewish condition will be much better. Once again, they regain their great influence and high-ranking positions :ministers or ambassadors. In 1438 , the jews of Fes are accused of violating a mosque and are force to settle in a new neighborhood, near a salt mine, that will be name the mellah. All the jews, rich and poor, must settle there. Many jews flee then to Spain. Regardless , the sephardic judaism will spread all around the Mediterranean. In Morocco, it is also the time of the rivalry between spanish and portuguese jewish communities, and also the indigenous jews. During the 16th and 17th centuries, under the Saadian dynasty, the persecutions will be back. Conversions , harassments and exorbitant taxes. What's more, several epidemics will cause thousands of deaths in the jewish population. In spite of that, some jewish dignitaries will keep their high-ranking positions. Near the end of the reign of the Saadians anarchy will help the rise of the Alaouit dynasty, still in power to this day in Morocco. Under their rule, the condition of the jews will greatly improve. The jews will occupy very influent positions more and more. When in 1704 the english seize Gibraltar , numerous jews settled there. In 1765 , the Sultan Mohammed ben Abdallah builds Mogador and gives several jewish families, commercial privileges that will help towards the development of the town. The beginning of the 19th century confirms the opening of Morocco to the Occident and the emigration of many moroccan jews in England and America. In 1803 the first school of the Israelite Alliance is opened in Tetuan,in 1865 in Tangier and in 1867 in Mogador. The end of the 19th century will be most troubled, riots in Sefrou (more than 40 jewish deaths) , looting of the mellah in Mogador , persecution of communities in Fes, Meknes, Demnat and Marrakech. In 1880 , the Madrid conference consecrates the penetration of the great powers into Morocco. In 1906 , the Algeciras conference gives shape to the spanish and french zones of influence. In 1907 , in Morocco, french nationals are assassinated. These murders igive the needed excuse to general Lyautey to begin the occupation of Morocco. In 1912 , a protectorate treaty is signed with France. Fighting remaining resistance will last ,however,until 1927. Thanks to the Israelite Alliance,the teaching of the french language will take on great importance within the jewish community. Creation of newspapers, printing shops and editing houses. Hospitals , clinics and charity organizations. 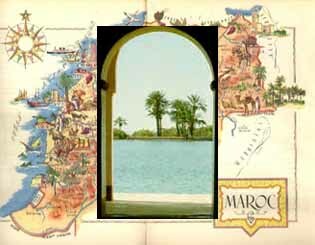 The protectorate will also the emigration of moroccan jews to North and Latin America. Sionism will develop as soon as 1924 and a conference will take place in Casablanca in 1930. Help will be organized for the refugees fleeing nazi Europe. After the surrender of 1940 , Vichy applies the laws of exception with numerus clausus in government jobs, education and other sectors of the economy. The futur Mohammed V will support the jews in many occasions. In november 1942 , the americans land in Morocco during Operation Torch, they are welcomed with great joy by the jewish population. Vichy laws and the statute of jews will only be repealed several months later . In 1948 , the state of Israel is born. Some violence takes place in Morocco,killing 40 jews. These riots trigger the beginning of massive jewish emigration to Israel. The sultan Mohammed V is deposed and forced into exile by french autorities in 1953. In 1954 , riots broke out in several towns, some jewish schools are torched and some mellah looted. Mohammed V is returned to Morocco and the independence is declared in 1956. Jews occupy important duties within the moroccan government and administration. The hostility of the Istiqlal Party towards Israel and the action of sionist movements will favor a new emigration, often in clandestinity in destination of Israel , France , Canada and the United States. But all these jews, now settled in Paris, Jerusalem , Montreal or New York , still keep a part of their heart in Morocco where their ancestors have lived for more than 3 millenia. Nota : the text you have just read in no way claims to be a complete history of the Moroccan Jews or Judaism. It is at best a summary and can only feature the great lines and events of that history. Help us,with your sources,anecdotes, documents and testimonials to enrich this magnificent saga , the saga of the Moroccan jews.